Raise your hand, if your luggage goes from being organized at the start of a trip, to looking like a crumpled mess, in 2 days flat. Despite my best efforts, this is my typical pattern, every time I go on vacation. Trying to fit things back like a jigsaw puzzle, is difficult when everything in my luggage is a different shape. It didn’t occur to me, until recently, how to fix this problem. By chance, I bought a luggage cube, and quickly realized how genius they are. Why didn’t anyone tell me? Many of my friends travel, but none had been using a luggage cube. Organizing your belongings in cubes, not only makes things easy to find, but keeps everything wrinkle-free. I used to organize with ziplocs (still do), but they were too flat and small to be used with jeans and sweaters. And once you buy luggage cubes (or organizers), they will last you for years. I still have my first one, 3 years later and it looks the same as the day I bought it. They work especially well, if you are selected for extra security searches by airport security. The cubes are easy to search through and there is less embarassment from having your undergarments searched through. I find that airport security are able to search my bag quicker, due to my excellent organizing skills. To get a good idea of how much you can pack, here’s a rough guide for sizes S, M, and L. (Note: sizes vary by brand). Small Cube (6 x 10 in) – 3 shirts, rolled up or one week’s worth of undergarments. 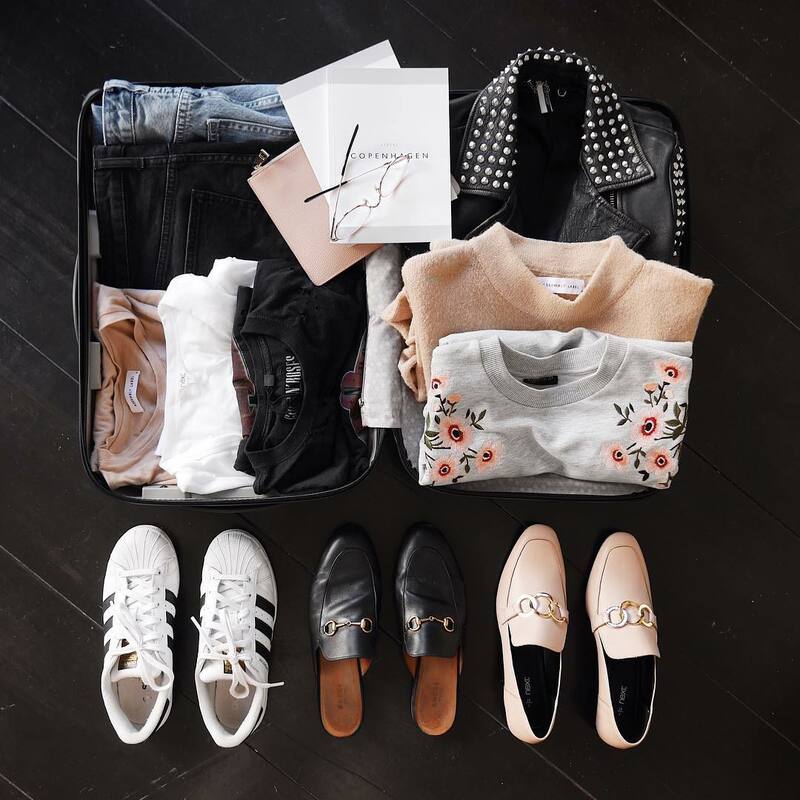 PACKING MADE EASY: These packing cubes compartmentalize similar sized items in their own "small drawers" right inside your luggage or carry on. Expands 3 full inches providing much needed extra room during travel. Also features a double zipper compression system to remove air, compress clothing, and help you save space. ARRIVE ORGANIZED: The perfect travel organizer to prevent clothes and other items from shifting in your suitcase during travel. Stay organized and have fewer wrinkled clothes, leaving you with more time during work trips and vacations. 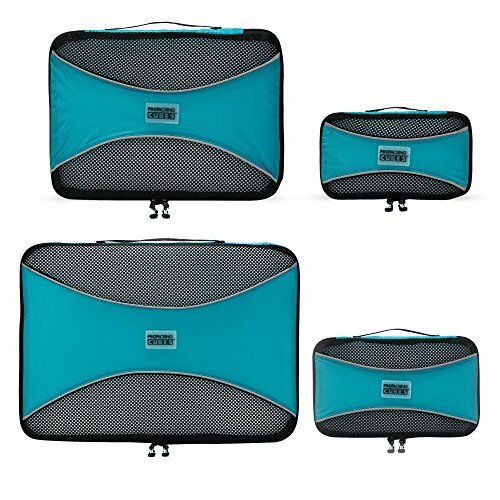 SMART DESIGN: These luggage organizer packing cubes have breathable mesh panels to keep your clothes fresh, and so you can easily locate all the items in your suitcase. 2 way pull zippers for fast opening and closing. 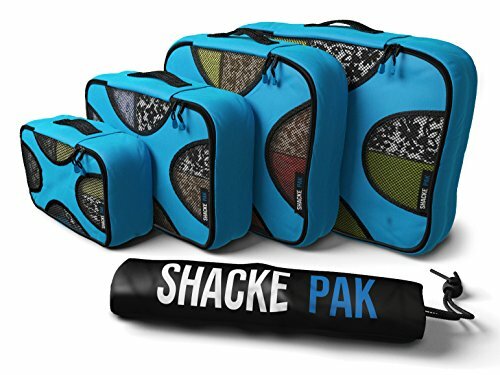 GRAB HANDLE: These packing cubes have a built-in grab handle to easily carry your clothes and other belongings without removing them from the cube. Great way to move all your clothes into a hotel drawer at once. Leave them in the packing cube and your clothes never come into direct contact with the hotel drawer. More Info Product prices and availability are accurate as of the date/time indicated and are subject to change. Any price and availability information displayed on Amazon.com at the time of purchase will apply to the purchase of this product. Most packing cubes, are one size only. However, this cube gives you the option of expanding it, making it easy to pack more clothing. You can either expand it before your trip, or once you get there. I find it good for storing socks, and then later expanding it to add souvenirs I’ve purchased, once I’m on vacation. I always leave about 20% of extra space in my luggage anyway, for any souvenirs or food I bring back. Always under pack your luggage. You’ll want to have enough space for souvenirs. This organizer is a small size and is 6 x 6 x 2 inches. It expands from 2 inches in height to 5 inches. The breathable mesh panel on top, makes it easy to find what you’re looking for. The material is made of nylon and feels sturdy, yet light. It’s a great choice, if you just need one cube, or are trying one out for the first time. SAVE BIG ON!! SIMPLY THE BEST LIGHTWEIGHT PACKING CUBES AND NOW CHEAPER THAN EVER BEFORE! Choose from MEDIUM, LARGE OR 4 PIECE VALUE SET. Simply select the format you want in the drop-down menu above & ADD TO CART. You´ll love these cubes from the leading specialist brand. Cubes help you to organize your bag quickly, breeze through airport security, and pack / unpack in moments! This collection is an ideal gift for frequent travelers seeking the best travel accessories. LIGHTWEIGHT & DURABLE - Constructed using high-quality YKK Zippers, ultra light-weight rip-stop nylon, and reinforced seams, no matter how you pack it your cubes will go the distance. No weak stitching or broken zippers to worry about here. These Pro Packing Organizers with see-through mesh will become your best travel accessory! COMPRESS AND ORGANIZE YOUR LUGGAGE - Trying to find the best way to pack a suitcase or fill a backpack? You can expect approx. 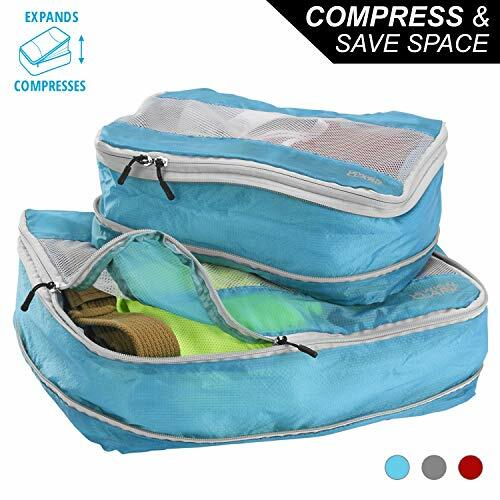 30% compression - yes that means 30% more space in your suitcase or backpack. You can organize your luggage by garment type or outfit AND use the cubes as laundry bags between stops! The smallest cube also works great as a toiletry bag or device accessory storage. 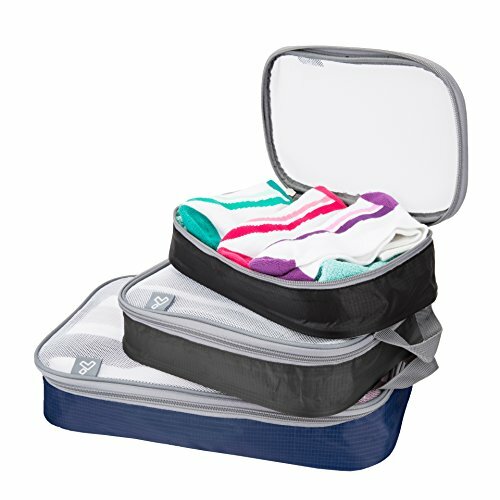 PACK SMART - Pro Packing Cubes act as space savers & will help you beat AVOID BAGGAGE RESTRICTIONS. They fit perfectly into most tote bags, carry-on / spinner suitcases, backpacks, weekender cases, and duffel bags. Ideal if you´re packing or planning for FAMILY VACATIONS, BACKPACKING, BUSINESS TRAVEL, HIKING, CAMPING, CRUISE LUGGAGE, RV STORAGE and BIKER SADDLEBAGS. See description for exact measurements. BUILT TO LAST A LIFETIME - Pro Packing Cubes are backed by a manufacturer LIFETIME GUARANTEE giving you peace of mind to buy these now. If you ever have any issues drop us a line and we´ll send you a replacement set or refund your purchase. You're simply getting a risk-free purchase, from a leading brand you can trust! This is another good choice, if you want to bring one packing cube in your luggage. They come in a variety of sizes, but the one pictured is the Large. It fits sweaters, jackets and anything thicker in your wardrobe. The dimensions are: 17.5 x 12.75 x 3.25 in. It’s light, yet sturdy, with reinforced seams and rip-stop nylon. The zippers are of higher quality. Compared to most packing cubes, this one is more rigid. It doesn’t make a huge difference to me, but if you want a more rigid structure this one is good. I am a fan of expandable packing cubes and in this set, you get one medium and one large. They are harder to find than the normal versions, but worth it. The nylon material is well made and the mesh screen allows you to find your items quickly. Because of its loose shape, there is no need to squeeze your clothes into the cube. I find that the less rigid a cube is, the easier it is to pack. Both packing cubes fit easily into my carry-on luggage. If you don’t necessarily need your cube to expand, these are a good choice. The set comes with a medium and large cube. The material is made of rip-proof, waterproof, nylon material. The mesh is snag resistant and makes it easy to spot your belongings inside. I found the zippers to be easy to open and close, thanks to their unique pulls. You can’t see from the photo, but they have a convenient fabric handle on one side. For extra organizing options, this set comes with 3 packing cubes. The piped edges add structure and help to compress clothes vs their non-structured counterparts. Small: 10.5 x 6 x 2.75 in. Large 14.25 x 8.25 x 2.75 in. The nylon material is waterproof and tear-resistant. 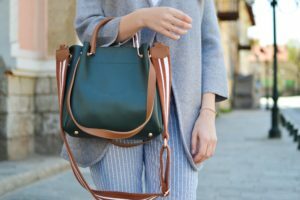 The bright colors help to identify each bag, for easy spotting. They have a convenient handle on one side and mesh panels on top. All three were able to fit on my carry-on luggage. 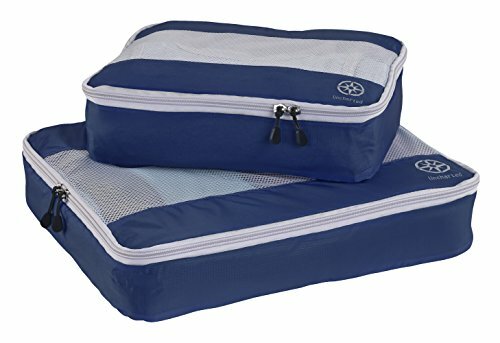 Large: 14" x 5" x 2.75", Medium: 10" x 5" x 2.75", Small: 6.5" x 5" x 2.75"
This set of three packing cubes is a great choice for travel. As a bonus, they also come with a Warranty against defects in the materials. The dimensions: Small: 11 x 6.75 x 3 in. | Medium: 13.75 x 9.75 x 3 in | Large: 17.5 x 12.75 x 3.25 in. The dual zippers make opening each cube very convenient. As usual with packing cubes, these have a mesh top. However, the panel of fabric between the mesh, adds a bit of support to the top. The material is made of breathable nylon fabric with finished cotton and finished wicking. I was able to fit these easily into my carry-on luggage. X Design with Double Stitching - Creates a Strong Reinforced Lid to Hold Your Clothes in Place and Prevents the Bag Material in the Middle to Fold Upwards. 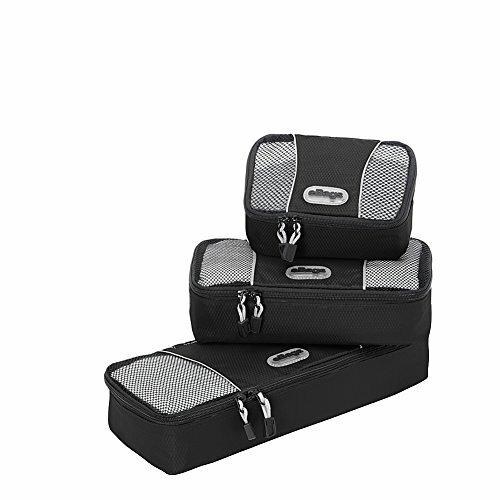 If you like everything to have its place, this set of four packing cubes fills that need to be organized. It comes with four assorted sized, so you can really fine tune how you organize your luggage. The design is very sturdy and features double-stitching, which reinforces the structure of each packing cube. You won’t have to worry about flimsy cubes that will disintegrate over time. Adding to the durable stitching, the packing organizers are made of water-resistant nylon that feels durable. As a bonus, this set also comes with a laundry bag to keep your dirty clothes separated from your clean clothing. I usually use a large Ziploc for this, but this is much better. So many organizer sets come in standard black or grey, but this set comes in eight colors to choose from. From pink to navy, you’re sure to find a color you like. Overall, I think this set is an incredible value for the quality that you are getting. P.S. This makeup bag is pretty and practical.